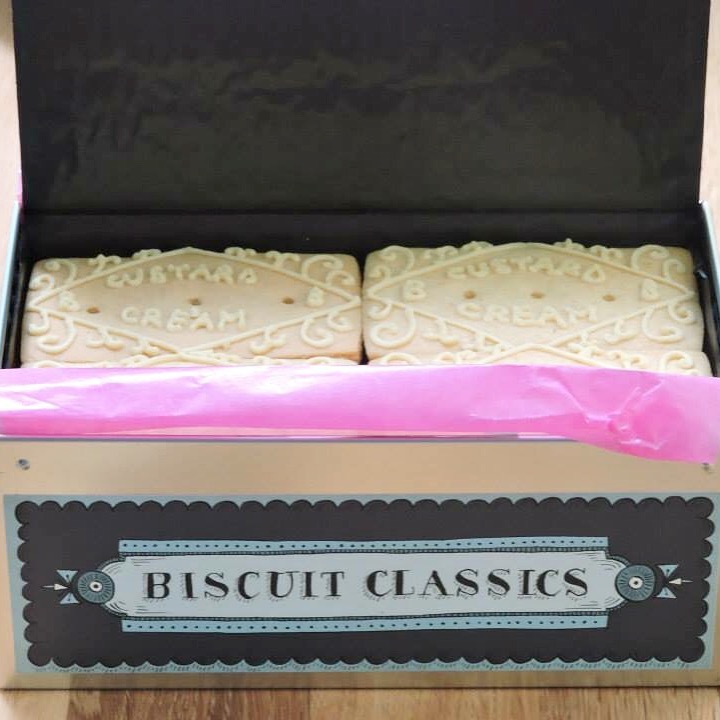 My favourites are the old school classics, so I was over the moon to see that Biscuiteers are selling their own hand-made Custard Creams and Chocolate Bourbons (two of my faves!) until the beginning of September. It’s always a great day when something like this arrives in the post, I couldn’t wait to try them! I don’t actually know the last time I had a Custard Creams, so it was very nostalgic. They tasted just like the original versions but even better. The butter icing was so rich and creamy, with a perfect level of crunch on the biscuit. I’m sure Mary and Paul would be very impressed if this was served up in the Bake Off tent! 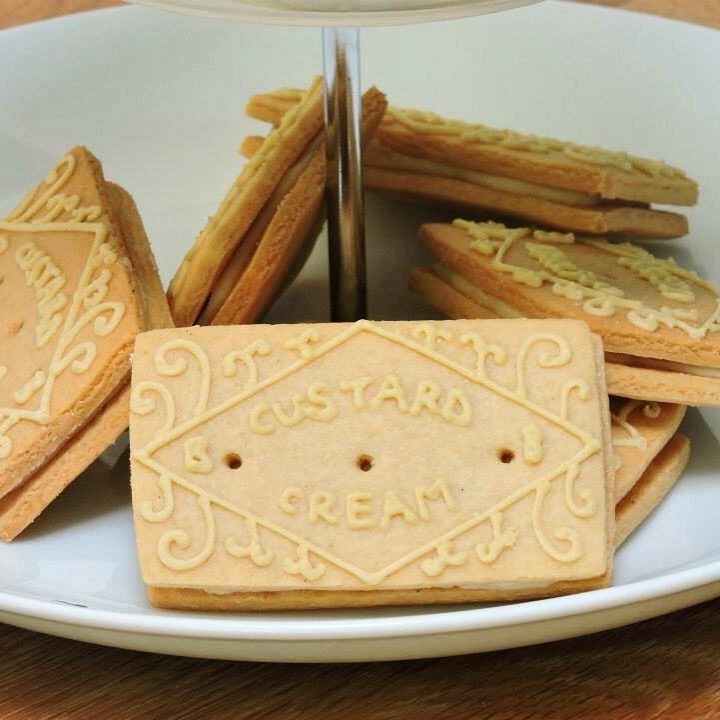 They would make a fantastic present, and both the Custard Creams and the Bourbons are available to buy on the Biscuiteers website for £27.50 per tin, plus postage and packing. 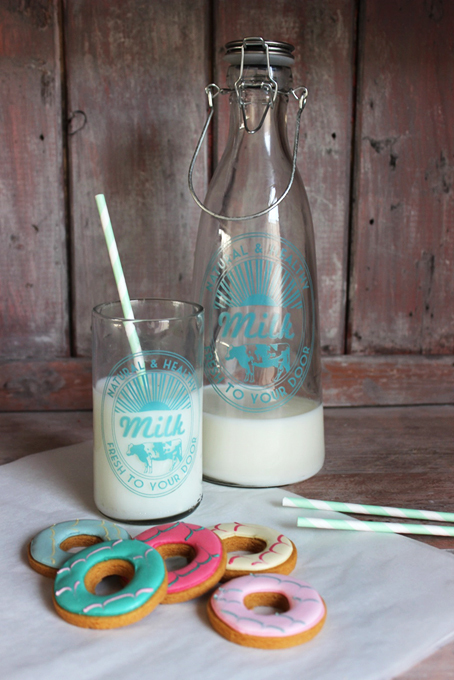 But perhaps the more creative of you would rather have a go at making them for yourselves? Well no problem, because Biscuiteers have kindly provided the recipe! Beat these together with your chosen flavouring ingredients until light and fluffy and completely combined. Keep the butter cream covered closely with cling film until you are ready to use it. 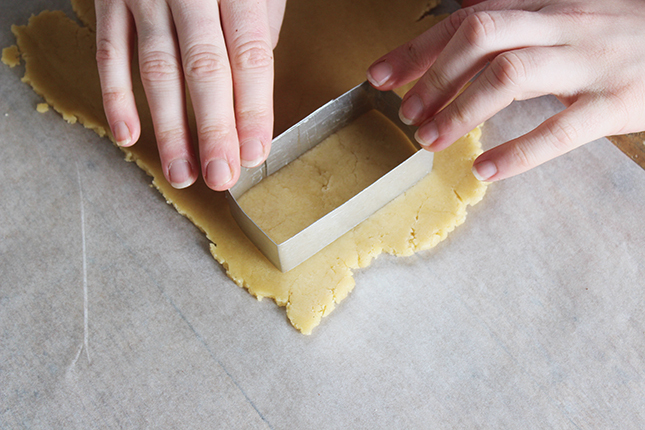 1) Create a batch of our vanilla biscuit dough and then cut the dough by hand, or use a rectangular cutter to make 24 vanilla biscuits. 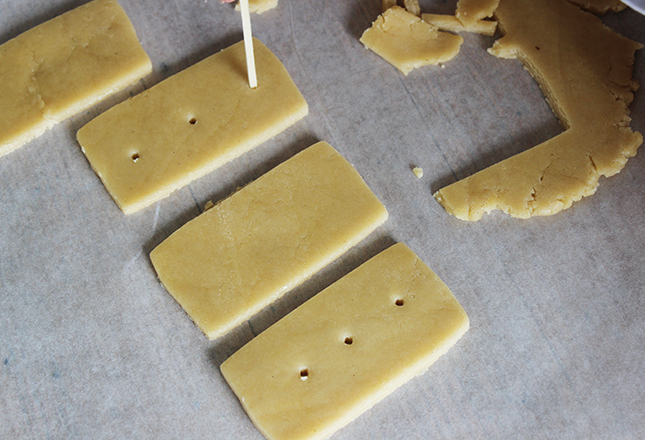 2) Before the biscuits are placed in the oven, poke three evenly spaced wholes on half of the quantity of rectangles. 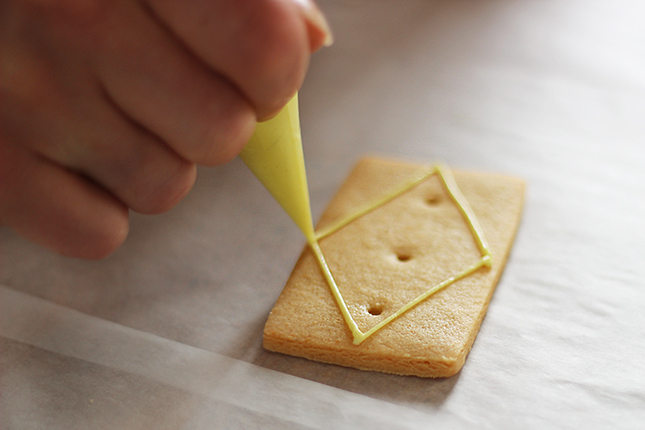 This will be for the tops of your custard creams. 2) Bake for 15-25 minutes depending on the size of your biscuits at 170°C, and leave at least 15 minutes to cool before icing. 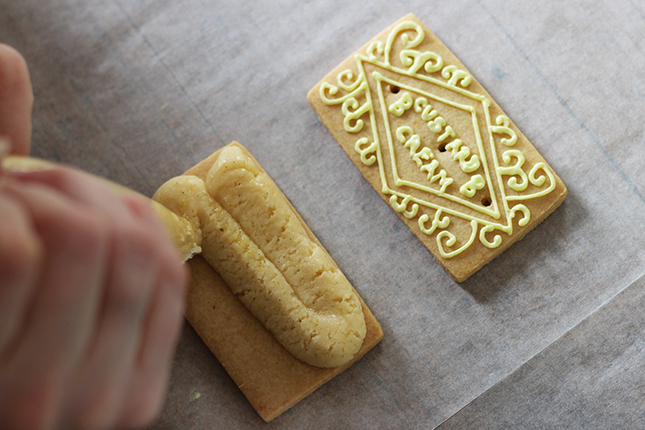 3) Once the biscuits are cool use the line icing to carefully pipe on the details and of course the name on to the 12 tops of the biscuit in the traditional custard cream pattern. Let the icing dry for around 10 minutes until it has set hard. 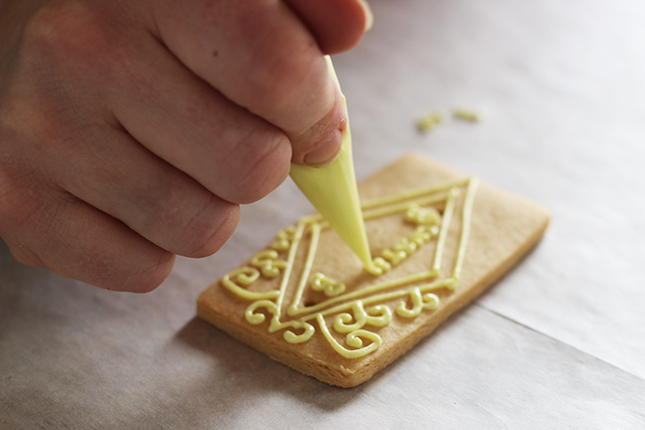 4) Use a palette knife to evenly spread the delicious vanilla butter cream onto the 12 base biscuits. 5) Carefully press the iced biscuit tops down onto the butter cream until they stick together. 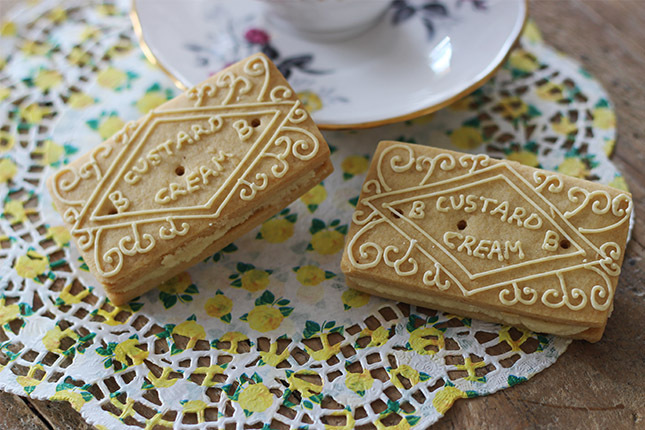 6) Finally, sit back and enjoy your very own classic custard cream! 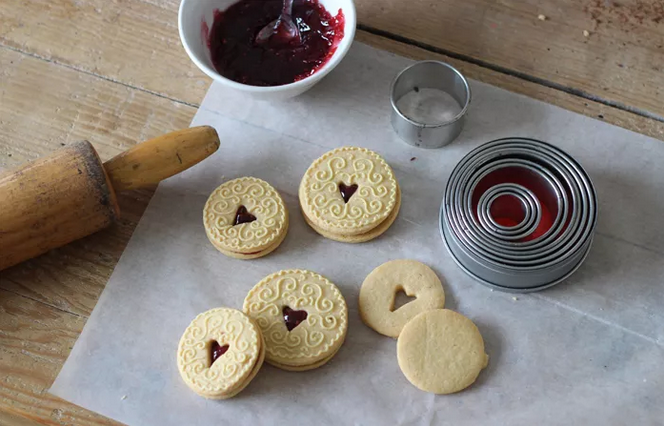 On the website, there’s also a Jammy Dodgers recipe! Click here for some of that jammy goodness! Update: They now also have a Party Rings Biscuit recipe, here. I don’t think there’s anything more old-school than Party Rings. And why was it that they were only ever served at parties? I think they shot themselves in the foot with the name there! I’ve fallen behind in my baking recently due to moving house, but I can’t wait to eventually get round to giving these a go! You can also read about my experience at the Biscuiteers Icing Cafe in Clapham, here. 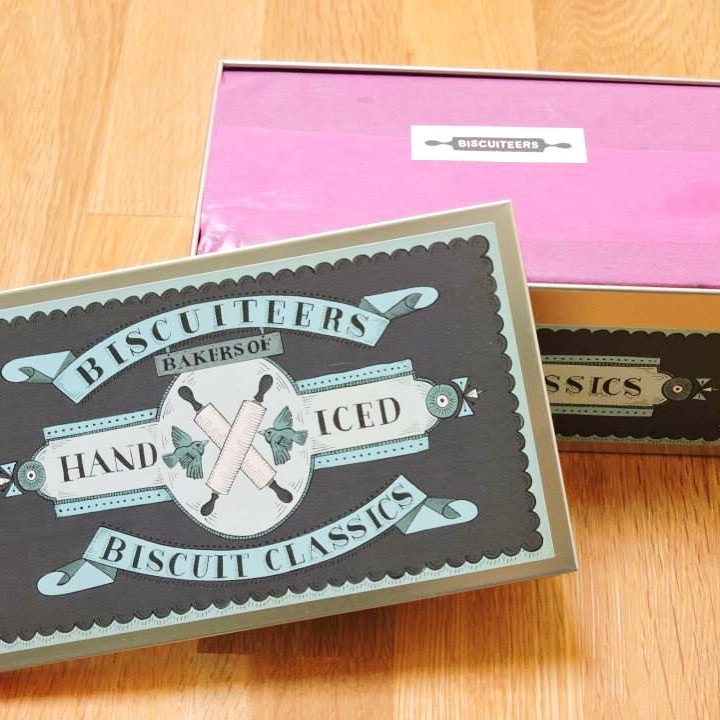 I was provided with a Custard Creams biscuit tin by Biscuiteers for review purposes but did not receive any payment. All views are my own. Previous PostFood Bloggers – Get To Know!